I am not really a quilter, I sort of fell into quilt making after being asked to design some quilts for friend that own a quilt shop. 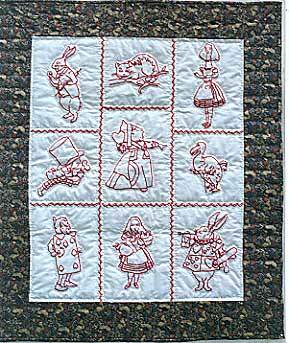 My most popular design, still sold, is a redwork Alice in Wonderland design. Redwork is an embroidered square used in the design, traditionally done in red thread. My first quilt for a skeptic, James Randi, incorporates redwork. My daughter Evelyn was doing an internship with Randi. We realized she would be there for Christmas and she needed a gift. I decided to make him a lap quilt incorporating redwork designs from an early “how to” magic book, and playing card fabric. Randi is pretending his head is mysteriously floating. Life is always magical when Randi is around. 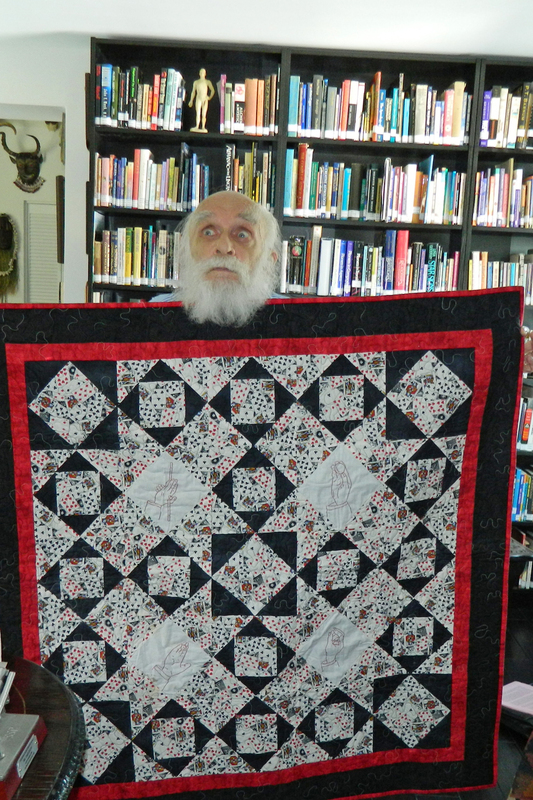 I was happy when visiting Randi to see that the lap quilt is still in use in his library. 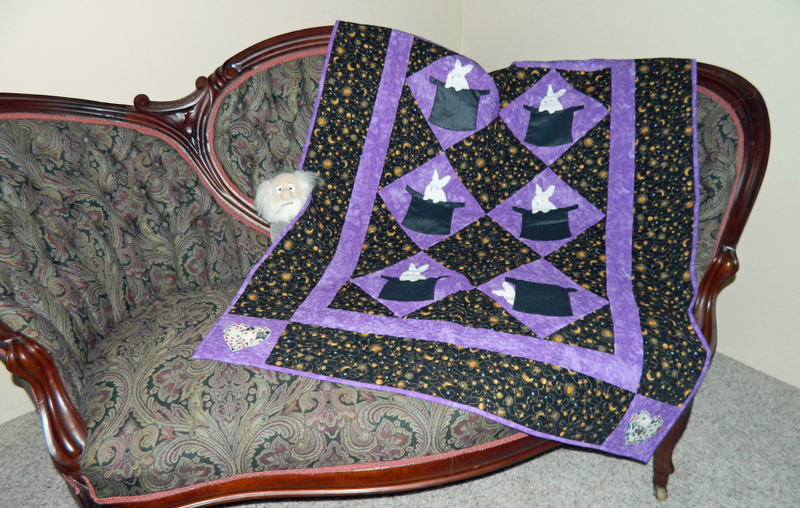 The second skeptic quilt I made was for the magician, Penn Jillette. I found out he was expecting to be a father, and made a quilt for Randi and the JREF staff to give to Penn and his lovely wife. 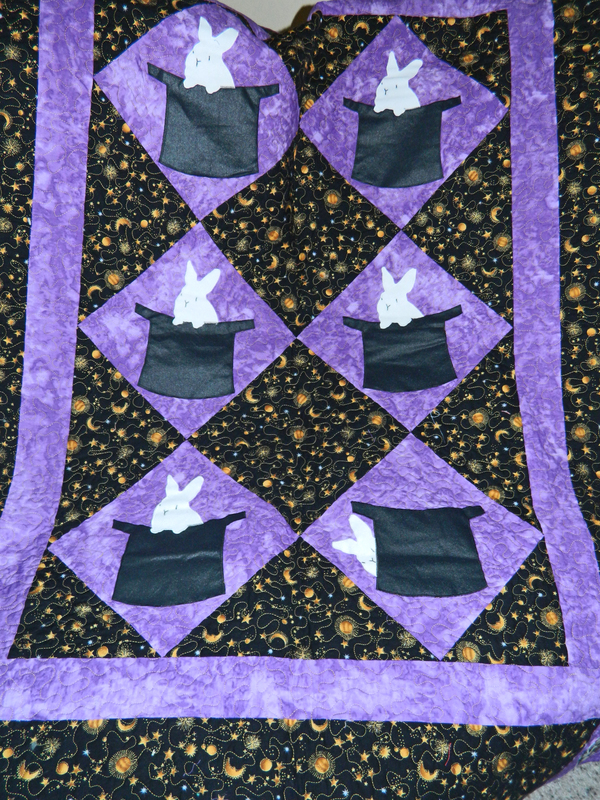 I hope Moxie enjoyed many magical nights tucked in this bunny themed quilt. It’s a very simple design, but I decided to make two of the quilt. The second quilt awaits another skeptic baby, I just haven’t got around to giving it away yet. My own cat Moxie, named after Moxie Crimefighter of course, enjoys checking it out. Any quilt belongs to her, she’s as feisty as her name. I’ve made other quilts for skeptic friends, including a Doctor Who baby quilt (someone else bought the very expensive fabric for me to piece) and a Star Trek quilt for my daughter and son in law. Yes you can buy Star Trek and Star Wars fabric! I’m not a talented quilter, but I do enjoy making gifts for friends. The sofa, if you are wondering, was bought by my Grandmother Evelyn (daughter Evelyn’s name sake) in the 1930’s for 50 cents. I won’t tell what I paid to have the frame redone by a museum quality restoration specialist, and the upholstery done by a specialist. That pin and tuck costs a lot extra, but was how it was originally done. It is early Victorian, before the Civil War, and now resides in a bedroom where cats are only sometimes allowed! Thanks for linking to my post! 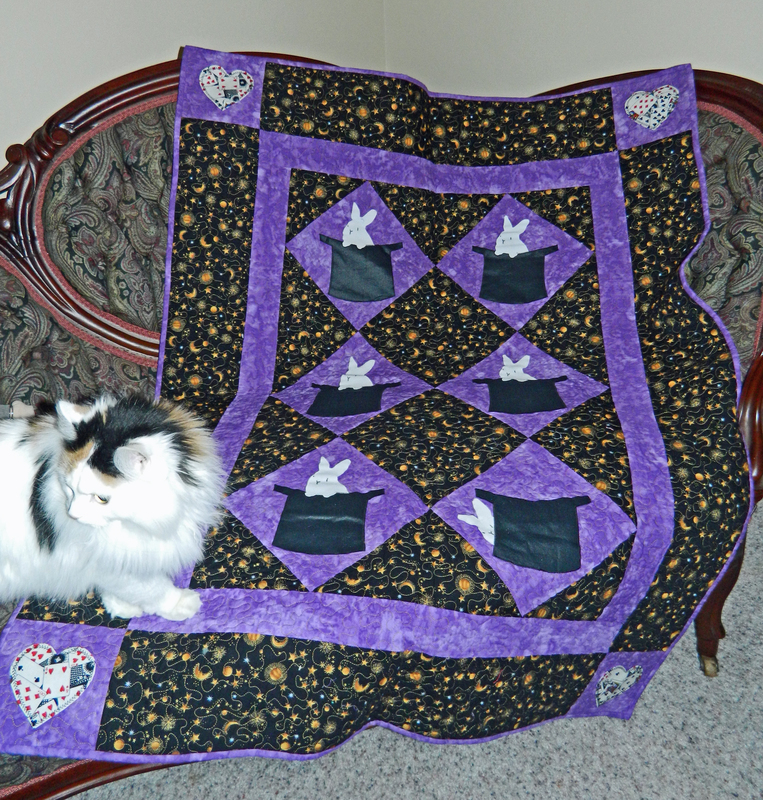 Your quilts are wonderful, and Moxie is awesome.